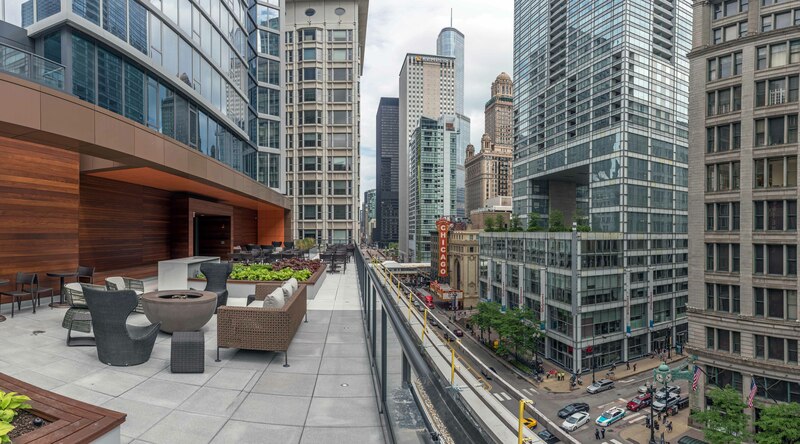 Marquee at Block 37, 25 W Randolph St, is a must-visit new apartment tower in an exciting, convenient location. 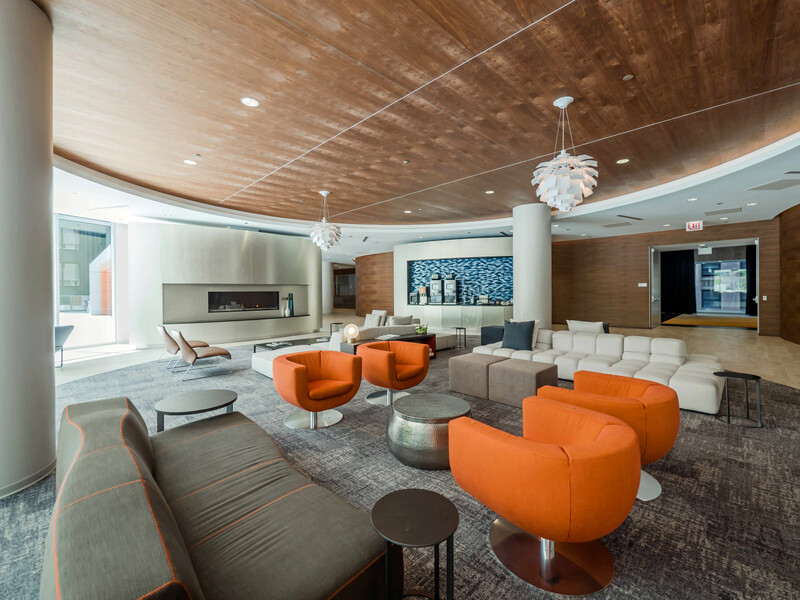 Click the new “Schedule a tour” feature at the top of Marquee’s website to arrange your visit. 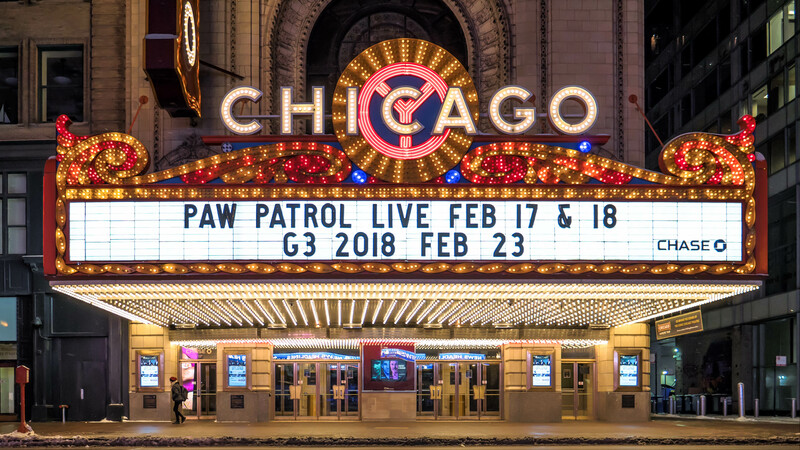 Marquee is flanked on the north and south by theaters, a Walgreen’s pharmacy, and enticing restaurants, and on the east and west by Macy’s and Daley Plaza. 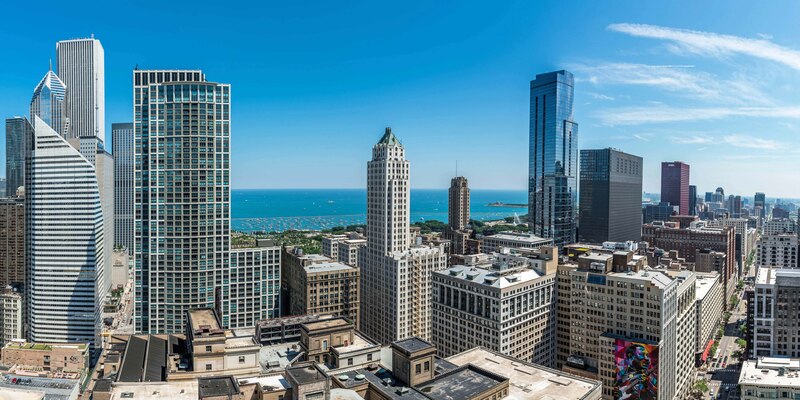 Block 37 encompasses a 275,000 square foot multi-level indoor mall that includes shops, restaurants, theaters and direct access to CTA trains and the underground Pedway. 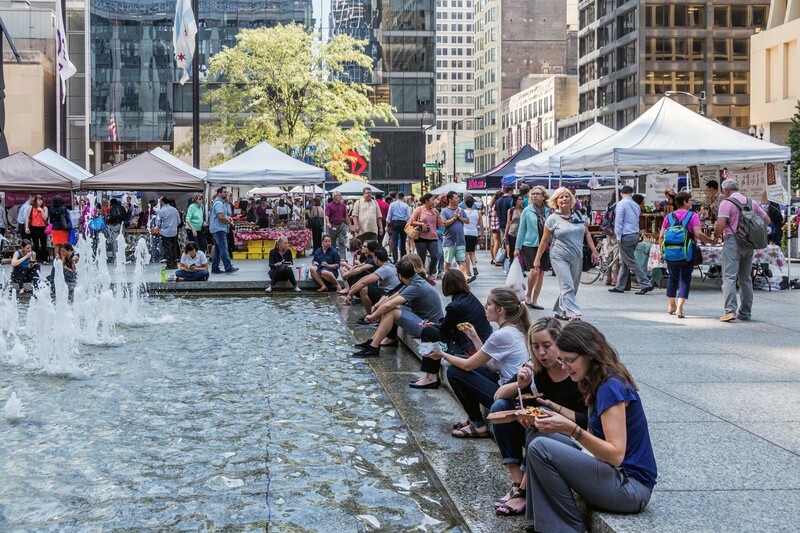 The Riverwalk, River North night clubs and restaurants and Millennium Park are a short walk away. Rents start at $2,133 for studios, $2,448 for 1-bedrooms, and $4,131 for 2-bedroom, 2-baths. Three-bedroom, 3-bath apartments are all rented at this time. Join us in the videos for tours of four different apartment layouts. 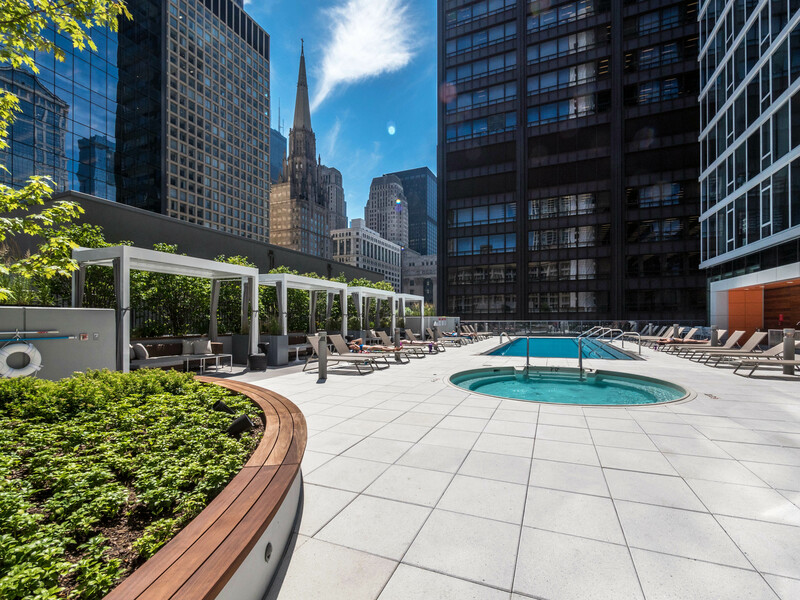 When you step off the elevator into the resident lounge at Marquee your eyes will be drawn to the bank of windows opening onto the pool terrace overlooking Daley Plaza, which hosts a seasonal farmers market on Thursdays. 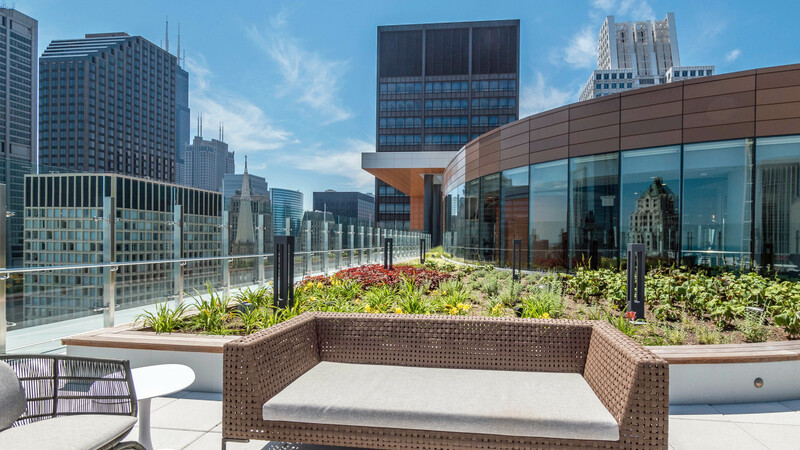 You’ll pass the business center on your way to the State Street terrace, which overlooks the Joffrey Ballet, the Chicago Theater, and the Oriental Theater. Marquee is in the heart of the downtown Theater District. 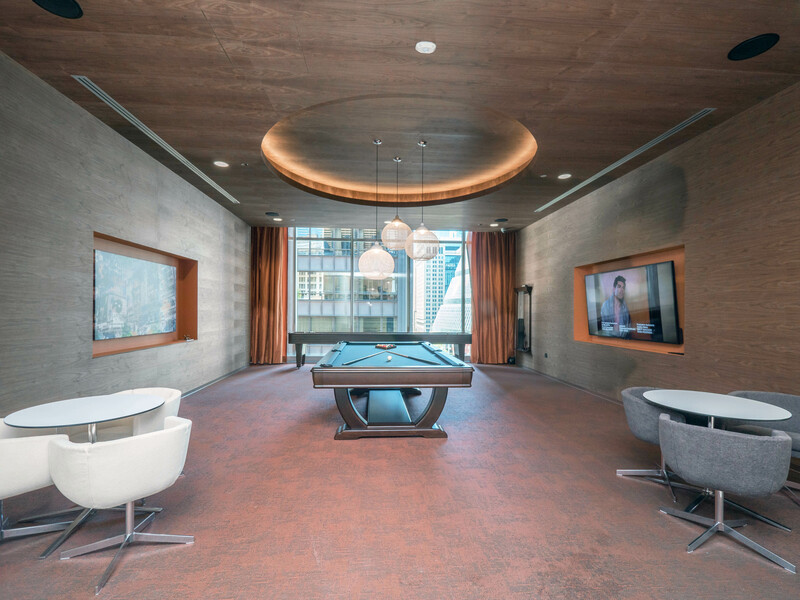 The amenities on this level include a game space and an event space. 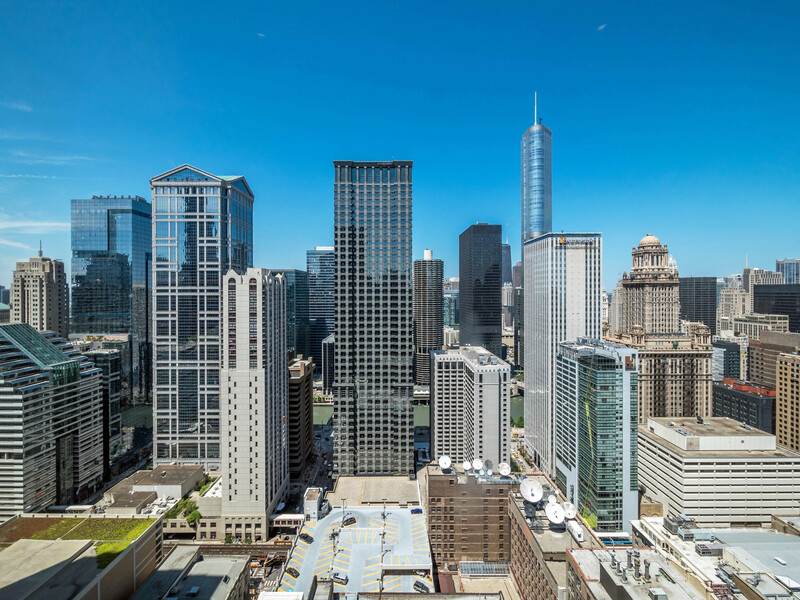 When you exit the elevator on the 38th floor you’ll want to pause for a look at the view north through a large window. Marquee is just south of the Chicago Riverwalk. 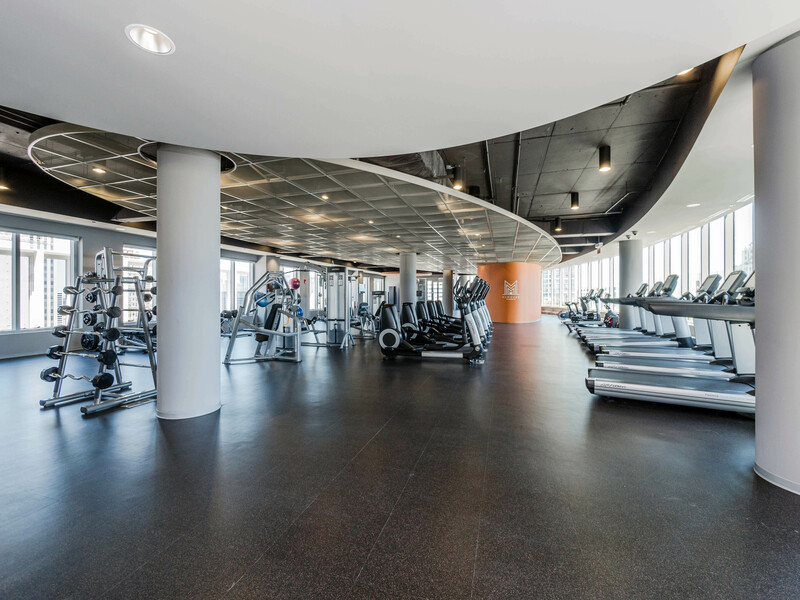 The spacious fitness center on the 38th floor has a yoga studio, a wide variety of cardio and strength-training equipment, and skyline views. 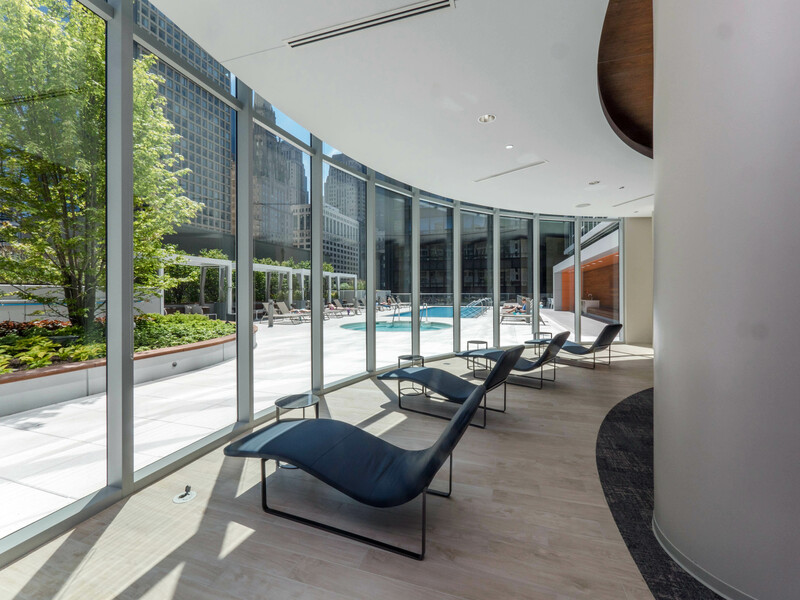 The fitness center opens to the Skyline Terrace, which serves up sweeping views to the north, east and south. A landscaped walkway leads to the sheltered Spa Terrace, which has a hot tub and adjacent sauna and steam rooms. 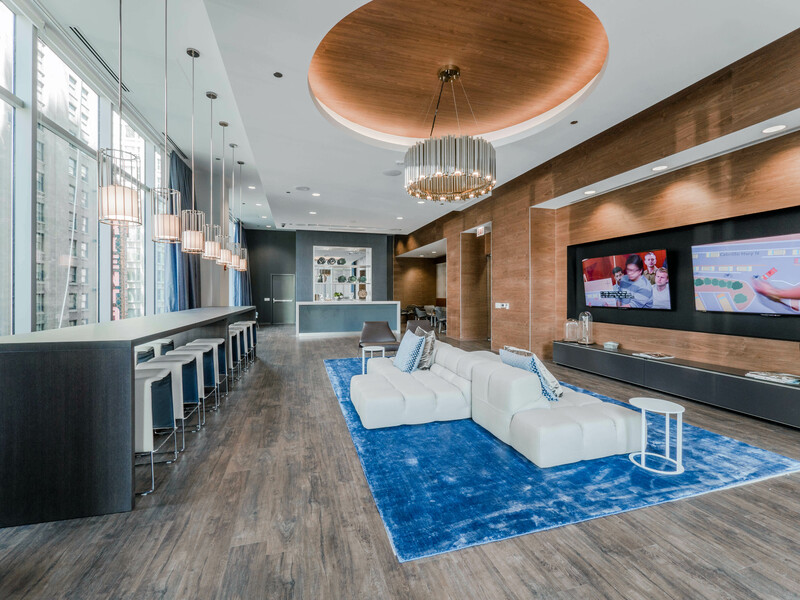 There’s a lot more to see at Marquee at Block 37, so you’ll want to budget the right amount of time for your visit. Marquee at Block 37 is a short walk west of Millennium Park and Michigan Ave. 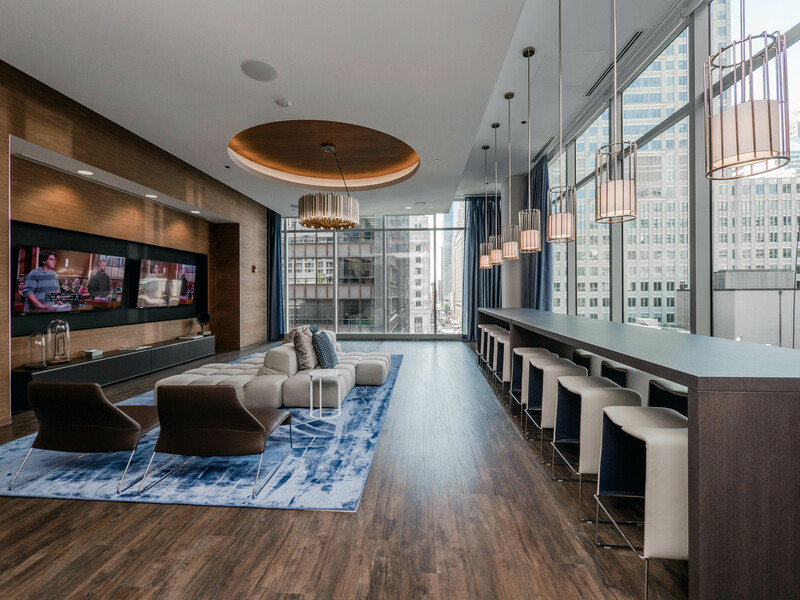 The leasing office is open daily on-site at 25 W Randolph St.